Pyrogallol is a strong reducing agent. Reacts with alkalis, NH3, antipyrine, camphor, phenol, iron and lead salts, iodine, lime water, menthol and KMnO4. Pyrogallol belongs to the phenols group. It is an old photograph developer and a low sensitizer in hair dyes. Turns gray on exposure to light or air. Water soluble. Inhalation of dust causes irritation of nose and throat. Ingestion may cause severe gastrointestinal irritation, convulsions, circulatory collapse, and death. Contact with eyes causes irritation. Skin contact can cause local discoloration, irritation, eczema, and death; repeated contact can cause sensitization. 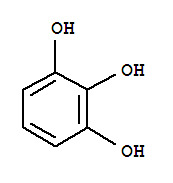 ChEBI: A benzenetriol carrying hydroxy groups at positions 1, 2 and 3. Complexing agent; reducing agent; alkaline solution indicator for gaseous oxygen. Odorless white to gray solid. Sinks and mixes with water.